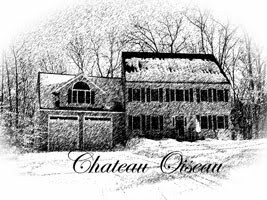 Chateau Oiseau: A morning at Coastal Vineyards! 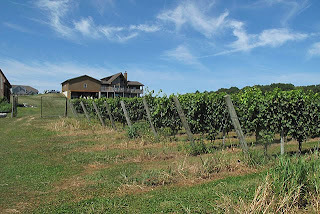 A morning at Coastal Vineyards! 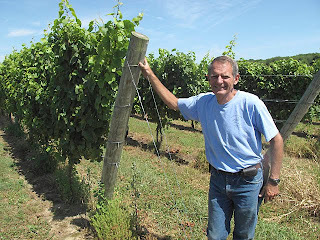 Yesterday I headed down to South Dartmouth, MA for a meeting with Dave Neilson, the winemaker and owner of Coastal Vineyards. I wanted to meet Dave because he is one of the first people to grow Marquette grapes in large quantity here in Massachusetts. If you are following this blog, you know that Marquette is a rather new variety of cold-hardy hybrid grape developed for red winemaking in cool climates. 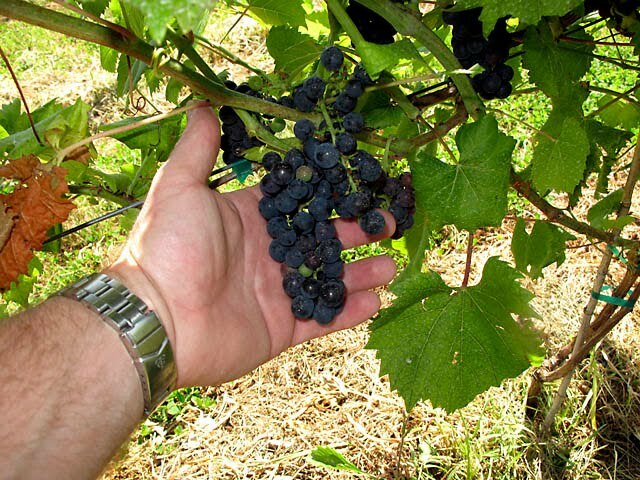 Unlike previous hybrids, Marquette is supposed to be one of the only cold hardy varieties that doesn't produce wine with the "foxy" taste for which labrusca-based wines are known. I showed up at Coastal Vineyards around 10 AM and Dave met me in the driveway. 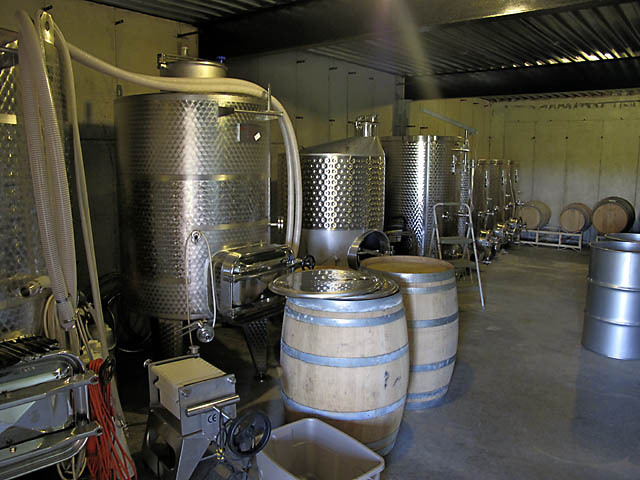 We walked down into his vineyard, thriving with a dozen varieties of grapes including Merlot, Sauvignon Blanc, Chardonnay and even Pinot Noir. He has planted 2 rows of Marquette consisting of about 200 vines. I couldn't believe how well his Marquette has grown in only 2 years. It easily looks like it is a full year older than mine, when in fact it is the same age. Dave said it well when he described his Marquette as "growing like weeds." After some tips on growing Marquette, we headed up to the winery to taste some of last year's whites and the '08 Merlot. I am not a fan of the syrupy Merlot from California but Coastal Vineyards does a lighter Merlot--more like a pinot noir. This is simply because it doesn't ripen as well in Massachusetts, so it's a lighter wine. They make a blush from the pinot noir. 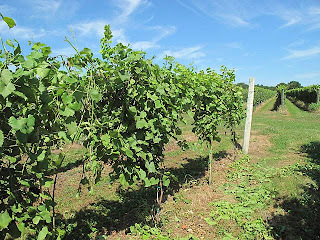 This is the reason he is experimenting with Marquette--it's a variety that ought to ripen exceptionally well in Massachusetts and make a full-bodied red wine. Of course, so far there are not enough grapes to make a batch of wine, but I expect Dave will have enough grapes in the fall of 2011 to make his first cuvée of Marquette. I can't wait to taste it! Thanks Dave for the great advice, and taking time out of your day for me! And for those of you who want to try a really fantastic white that is estate grown right here in Massachusetts, I really recommend checking out the Coastal Vineyards Seaside White which is a blend of estate-grown Sauvignon Blanc and Gewürztraminer. Delicious! And for red, of course that Merlot!